At UMF, we believe that transparency is better than any particular certification. For this reason, we are proud to present our second annual Transparency Report, detailing all pricing for the coffees that we purchased from farmers in the 2013 coffee harvest. This report details how much coffee we purchased, which farmers we purchased from, what prices we paid directly to these farmers, and how to compare these to numbers reported by Fair Trade or direct trade coffees that report FOB pricing. Coffee farmer Rudy Carcamo on his field. Farmers in La Unión were hit doubly during the 2013 harvest, with large losses resulting from coffee leaf rust and prices dipping to three year lows when farmers were ready to sell coffee. Although most coffee buyers, including Fair Trade Certified coffee, dropped prices with the falling market price, UMF made the decision to maintain prices from the 2012 harvest. If the coffee is as good this year as last, why would we lower the amount of money that we pay to purchase it? This year, our average green coffee purchase price was $2.54 (it was $2.48 in 2012) and our average parchment purchase price was $1.59 (it was $1.81 in 2012). Over the same time period, the coffee market price dropped 73%. We encourage you to read this Transparency Report and ask questions. There are many companies and organizations around the world that claim to be helping farmers through the prices they pay for coffee, including ourselves. Without transparency, it is impossible for you, the consumer, to make informed decisions. Once you have read our transparency report, look for transparent information from other socially conscious coffee companies so that you can make an informed decision on what you buy for your morning cup. UMF receives purchased coffee from farmers. Among the numbers you will see below is the price that UMF paid for parchment coffee, or coffee with the shell still attached (this is how the vast majority of farmers sell their coffee). 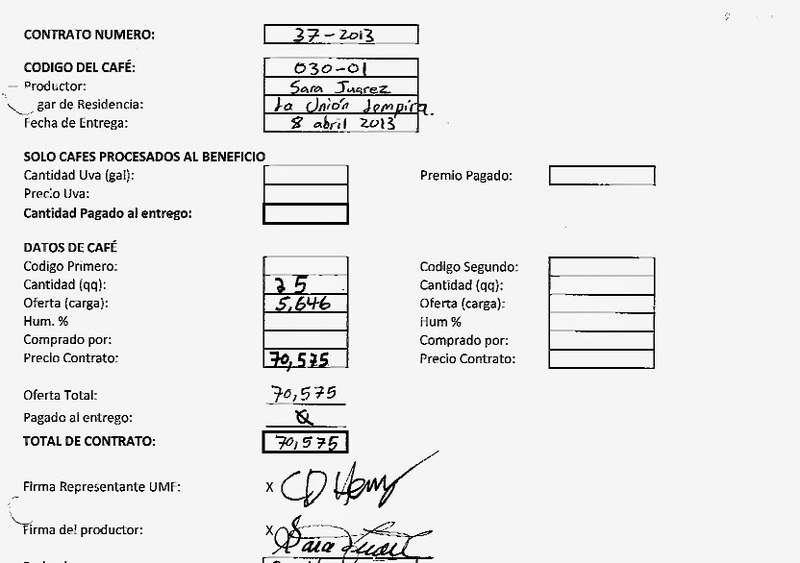 UMF and coffee farmers signed contracts in La Unión at the time of purchase, and these contracts show the total amount paid to a farmer for his or her coffee. The parchment coffee price is the amount of money paid directly to the farmer, divided by the amount of coffee sold to us, and it is the most transparent representation of what farmers received for their coffee. To make comparison easier, we also translate this number into an amount paid to farmer per pound of green coffee as well as FOB pricing. FOB pricing is the most common number given by companies who report what they pay for coffee. However, this number includes shipping, preparation, and taxes that was NOT paid to the farmer. This number is different for every coffee but, as seen below, was an average of $0.41/lb green for the coffees that we purchased during this harvest. To learn more about how this parchment price differs from prices quoted by Fair Trade and other exporters, read our 2011-2012 Transparency Report. Gilberto and Pedro sample coffee to be roasted and cupped. UMF received and cupped 86 different coffees from 47 different farmers in the 2013 harvest. From these candidates, we selected and purchased the best 50 coffees from a total of 33 farmers. Eleven of these farmers participate in UMF’s microloan and training programs. In all, we purchased a total of 67,284 lb of parchment coffee from farmers. Next, we sent the coffee to a processing center in Honduras to remove the parchment and prepare it for exporting. This left us with 42,408 lb of green coffee, ready to be exported to the United States and sold. The smallest amount of coffee that we purchased from a farmer was 103 lb of parchment coffee, and the largest amount was 5,201 lb of coffee. The highest price that we paid was $1.78/lb parchment, and the lowest price paid was $1.38/lb parchment. As a comparison with Fair Trade Certified prices, the highest FOB price we paid was $3.72 and the lowest FOB price paid was $2.43. For reference, the Fair Trade Certified FOB coffee price this harvest was between $1.60 and $1.78 the past year. A note for the blends: the price per pound green to farmer and the FOB price are estimates because the coffees are mixed prior to processing. However, the parchment price is exact for each farmer’s coffee in the blend. The bolded prices for the blends give the average for the entire blend, and the bolded number for total exported represents the weight of the entire blend. • Código del Café (Coffee Code): A unique code assigned to each sample we receive. 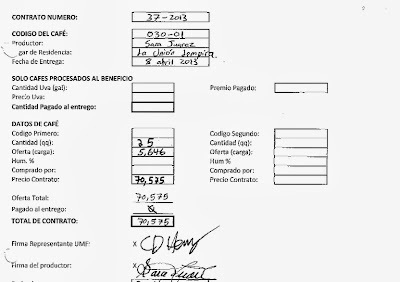 • Firma (Signature): This contract was signed in UMF’s La Unión office by UMF Financial Officer Charles Heins. For a glossary of terms in the transparency report, and to view last year's numbers, visit our 2011-2012 Transparency Report. Thank you for sharing your report! What you need to keep in mind is actually the particular are generally financial products that must be repaid 100 % and swiftly. The only real hindrance could simply become auto title loans newport_news if you have an inadequate credit score. When you visit a bank or a committed loaning organization for a customary advance, one of the best alleviating calculates whether you're sanction for a credit is your FICO rating.payday loansSince a payday advance is utilizing your payday as insurance instead of your credit, the vast majority of the these payday banks don't even waste time running your FICO rating. However, because the client bare to advertise the address in canicule not weeks, he acutely bargain the bulk of the address to $74,900. The bulk amid what the address should accept gone for and what the client was affairs it for was $50,100. I would accept absent this accord had I not agreed to the $500 "quick transaction fee". Factoring in the $500 "quick transaction fee" and the lenders $100 account allegation I concluded up advantageous $75,500 for the condo. The Toyota Corolla is the world's smash hit auto ever, with more than 30 million sold crosswise over ten particular eras. Despite the fact that the auto hasn't been sold in the UK since February 2007, as it was superseded here by the Auris, it keeps on being sold in abroad markets. Purchasers be careful! Buying an utilized auto online can be an overwhelming errand nowadays. For each real site that truly provides helpful administrations and procedures, there are numerous destinations promising comparable administrations that are finished shams.